September 2013 - Bring It! Now that it’s fall, comfort foods are an order. I love this warm millet salad mixed with roasted vegetables. Millet is my GO TO grain lately (check out these millet muffins if you have a chance). For you gluten free folks, this is a gluten free food and has lots of health benefits (good source of protein, essential amino acids, and fiber) so go for it!. Also, in a websearch, while trying to figure out what this grain was all about, I found it listed as the oldest human food and first domesticated cereal! So, I’m thinking it must be good for you, right? And if not, then it gets big points purely for it’s staying power. For this warm millet salad I used Brussels sprouts and carrots but you can mix it up with sweet potatoes, beets, asparagus, beans, or any other vegetable of your choice. And you can always throw in some tofu to make a complete meal. Perheat oven to 450. Toss Brussels sprouts and carrots with 2 Tbsp canola oil in large bowl. Season with salt and pepper, if desired. 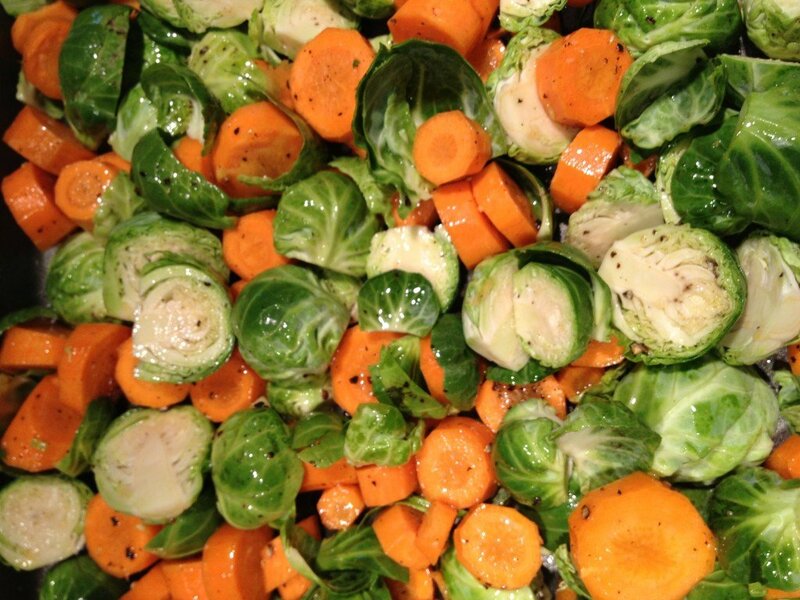 Arrange sprouts and carrots in a single layer in a 13 x 9 inch baking pan. Roast 20 minutes or until tender and a little brown. Cool 5 minutes. Heat large pan over medium heat. Add millet and cook 6-8 minutes or until golden brown. Add 2 cups water and bring to a boil. Reduce heat to medium low, cover and simmer 20 minutes, or until liquid is absorbed. Transfer millet to large bowl. Cool 5 minutes. 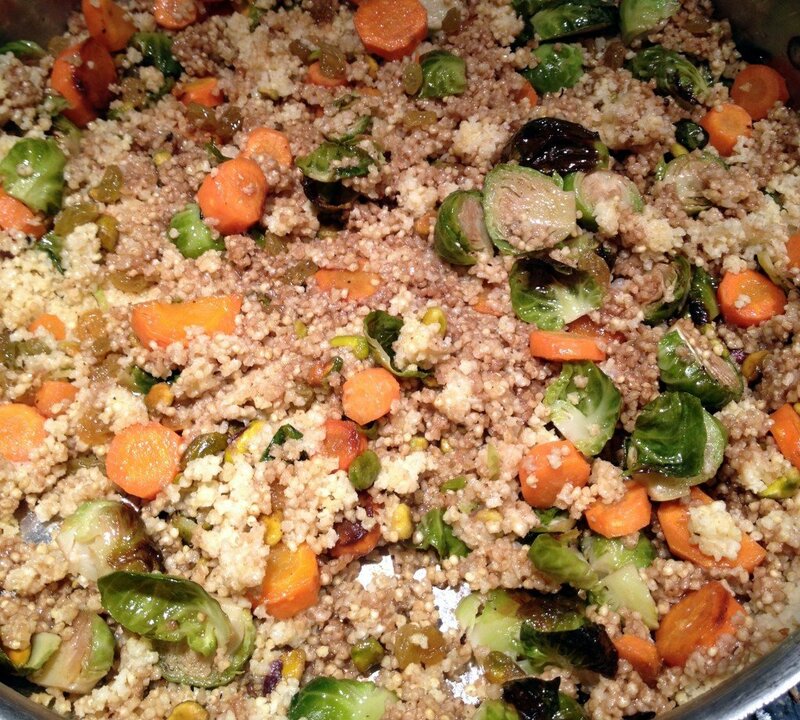 Fold in Brussels sprouts and carrots, walnuts, cranberries, and parsley into millet. Whisk together remaining 3 Tbsp oil, vinegar, maple syrup, lemon juice, and lemon zest in bowl. Stir into millet mixture. Add salt and pepper if needed. This entry was posted in Pots of Goodness, Salads and Sides, Veggie Delight on September 26, 2013 by Sue Hanlon. Because it is fall, and traditionally (for me) a time to cleanse (curse you watermelon sangria! ), I was planning to do a cleans-y post. 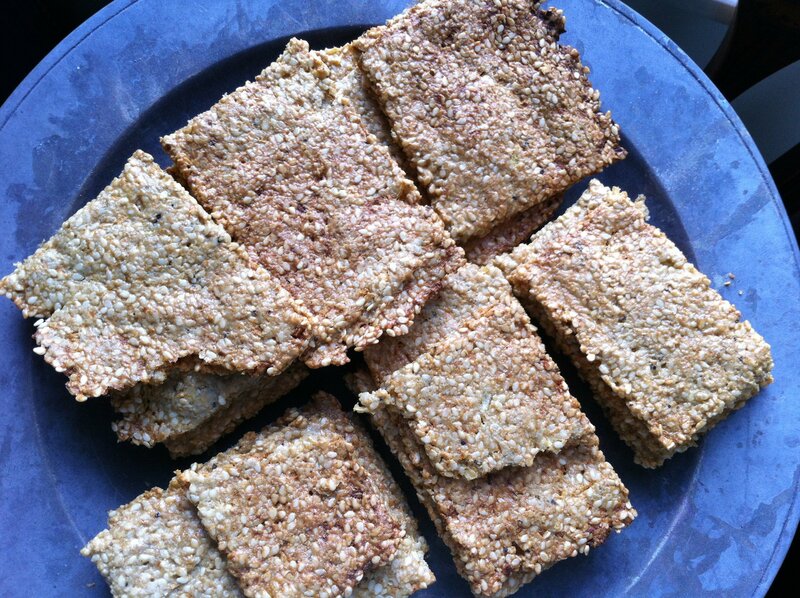 Mostly I needed a break from apple mania and an excuse to share the Endurance Crackers that I started making this summer and that, it turns out, are something of an Internet sensation. As far as I know they originally came from an excellent vegan site called Oh She Glows. I am very un-vegan but I love vegany things so naturally these seedy babies looked right up my alley. I made them a bunch this summer, and shared them around to universal approval from kids and adults, vegans and carnivores. They are full of good stuff and free of all the usual perps—gluten, nuts, grains, sugar. For a fleeting moment I even thought they would pass the paleo test. But noooooooooo. Apparently chia seeds—like my beloved chickpeas and black beans—don’t make the cut. The little wonder food, secret pellets of the Incas, bearer of magical running power has a husk and therefore it’s a no-go with the cave man clan. But chia seeds are key to the whole gig because they have this crazy power of gelling things together which gives the simple mix a way to morph into a legit cracker. Long intro. Here is the recipe, with advice and tweaks from myself and other cybercrackerphiles. There is even a sweet variation below (thank you Rowdy Baker) that is pretty tasty. And paleo peeps, I have failed you again… unless…maybe…click here and see. Preheat oven to 325° and line a large baking sheet with parchment paper. In a large bowl, mix the seeds together. In a separate small bowl, mix the water, grated garlic and grated onion. Whisk well. Add the water mixture to the seed mixture; stir until thick and combined. Season with salt and optional spices/fresh herbs. Spread the mixture onto the prepared baking sheet with the back of a spoon (or your hands) until it’s less than ¼” thick. * It may be little runny, but just keep smoothing. If it becomes too thin in parts, just patch them up. Bake for 30 minutes. Remove from oven. Loosen with a long flat spatula or pizza peel, cover with another greased or parchment lined cookie sheet, and invert. Alternatively cut into smaller squares and flip. Don’t worry if it breaks in a few places. They’re crackers, right? At this point, you can deeply score the surface into whatever size crackers you like (diamonds are shmancy. Rectangles and squares are perfectly fine.) This is also when you can go pro and brush the surface lightly with oil to make them nice and crispy. Bake for another 30 minutes, watching closely after about 25 minutes. The bottoms with be lightly golden in color. Allow to cool completely on the pan and break into pieces. Store in a covered container. They freeze well too. *Newbie cracker maker? Make it even easier on yourself by using two baking sheets and forming smaller, easier to flip rectangles. Remove from oven and sprinkle evenly with the chopped chocolate. Wait a few minutes and then spread with a flat spatula. Sprinkle with raisins if desired. When the chocolate has hardened (you may refrigerate it if you wish, to hurry it along) break into pieces and store in an airtight container. 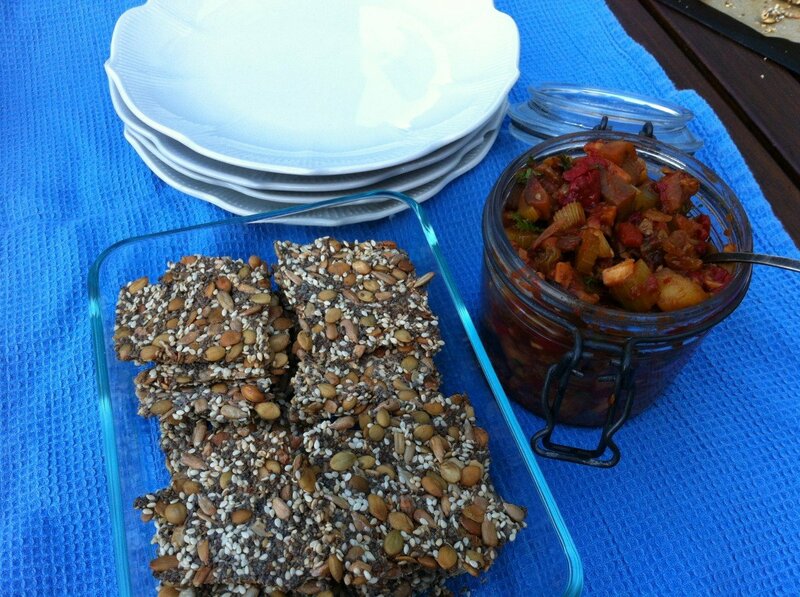 This entry was posted in Appetizers, Positive Snacks and tagged Chia seeds, gluten free crackers, healthy snacks on September 22, 2013 by Edie Morgan. And then it happened. 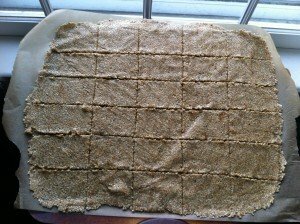 Just when I thought I would never find a decent snack that would pass the paleo test (note: I do not have the discipline to be a paleo eater, but in case I find it someday I want to be sure I could eat something other than bacon, cauliflower and coconut oil), I found these crackers. Even better than how good they are, is the fact that they contain no exotic or expensive ingredients—sorta what you would expect from a site called “brokeassgourmet.” Gabi, the aforementioned gourmet, describes her Simple Seed Crackers crackers as “shortbready” which I thought was odd, but after my 8th cracker or so I must say I agree. I suspect the sesame seeds may be in a gray area with paleos (they have a husk and all—see chia seed reality check in Endurance Crackers), but I’m going to enjoy these for a few days before I ask. Preheat oven to 350 degrees. Place sunflower seeds in a food processor and process for about 2 minutes, until smooth (the mixture will resemble a dry peanut butter). Add onion, sesame seeds, salt, pepper and water and pulse or stir, just until a thick, paste-like dough comes together. Place the dough on a piece of parchment paper and shape into a thick rectangle or square, to guide the dough’s shape while you roll it. 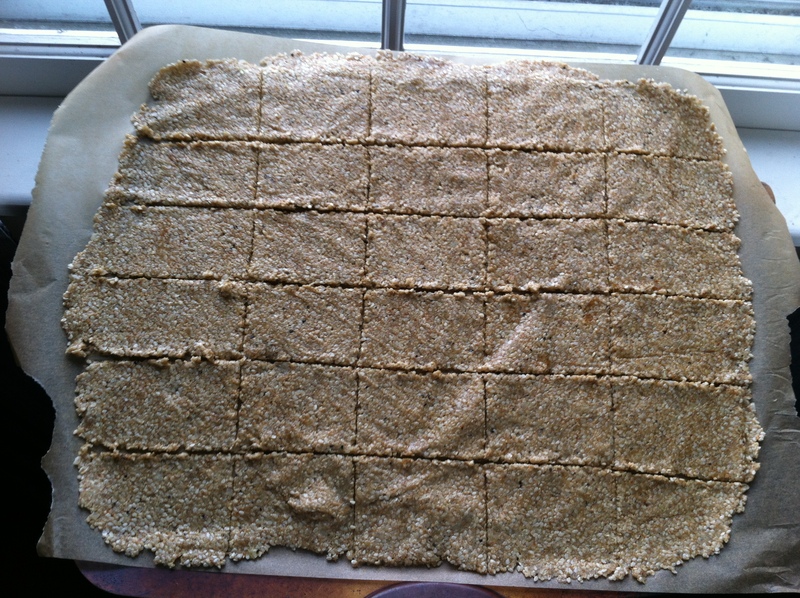 Place a second piece of parchment paper over the dough and roll with a rolling pin until the dough is about 1/8” thick. 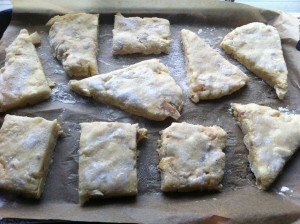 Remove the top piece of parchment paper and use a sharp knife or pizza cutter to lightly score (but not cut all the way through) the dough into squares (any size will work—mine were 2 1/2” squares). Slide the parchment paper with the dough on it onto a baking sheet and bake for 17-20 minutes, or until golden-brown (be careful not to let the crackers get too dark—burned sesame seeds have a foul flavor). Let cool for 10 minutes, then gently break apart along the scored lines (don’t worry if they’re imperfect—they’ll still be delicious). Makes 24-32 crackers, depending on size. This entry was posted in Appetizers, Positive Snacks on September 22, 2013 by Edie Morgan. Summer is skipping out and it’s just plain sad every year. 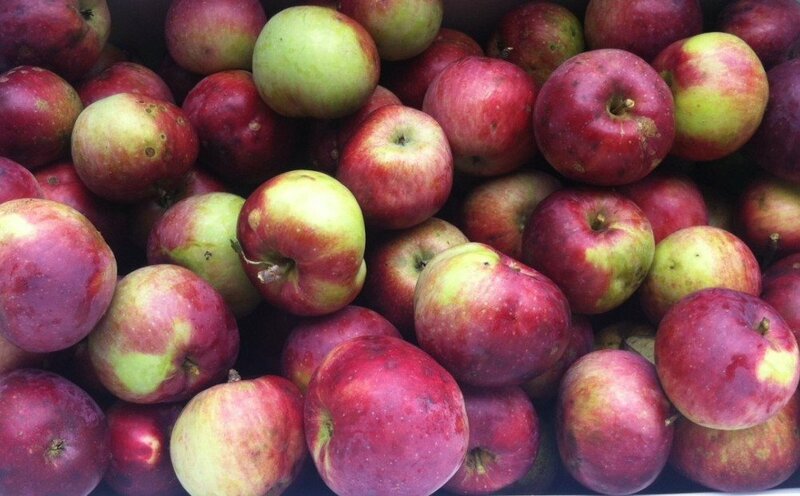 But on the bright side, it’s apple season! We’ve only got a row of apple trees—six or so, with two pear trees thrown in—but darned if that doesn’t serve up more fruit than I can handle. It hasn’t even gotten chilly yet and already the apple fest has begun. We’ve made applesauce, apple cider, apple cider syrup (yum! 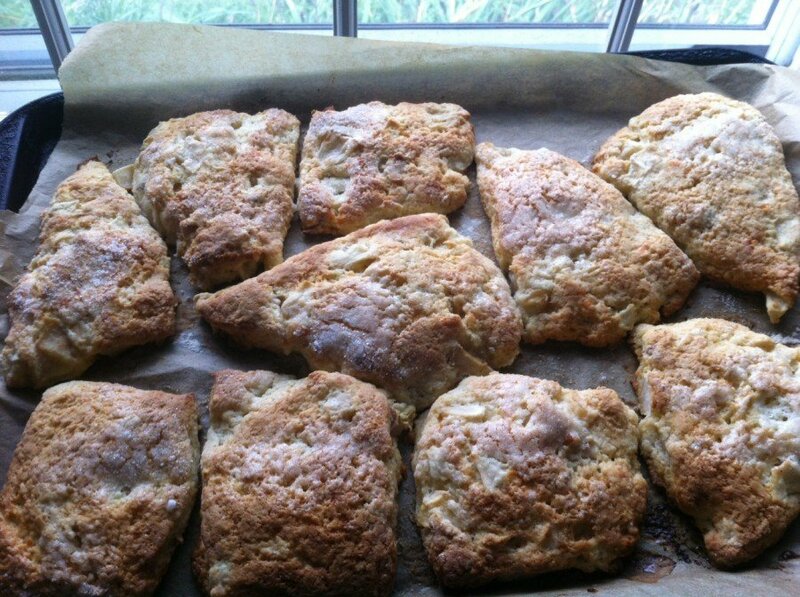 ), apple muffins, apple pie, apple compote and just now the first batch of apple cheddar scones. Oooh baby–they are the ultimate in apple goodness. Sadly, they don’t use many apples (get into cider and sauce for that), and they have a few more steps than my favorite slacker scones. They even require eggs fergawdssake, which is so un scone-y. But they’re worth it, and they work any time of day for any type of occasion, from picnic to shmancy party. This recipe, slightly tweaked at every stop, came via The Bitten Word and they got it from a book called The Perfect Finish. So there’s the provenance. 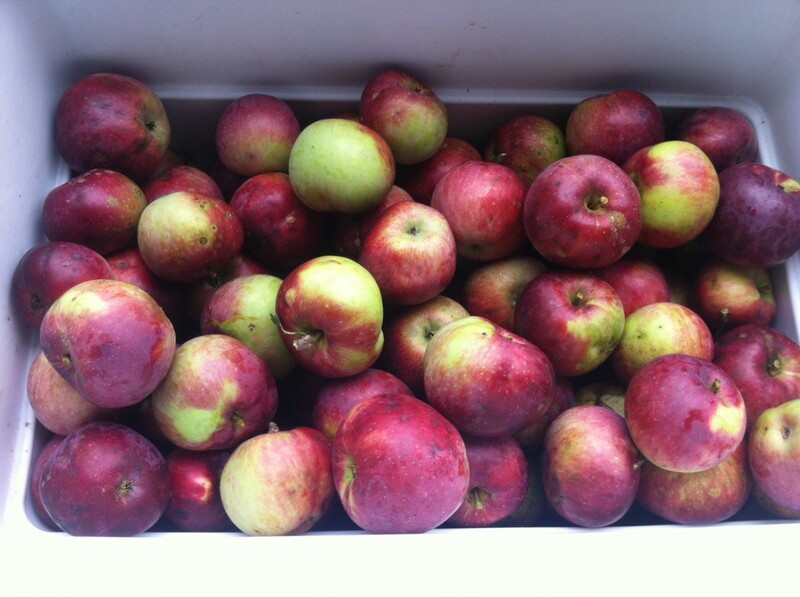 If you need apples come on over. Makes 6 generous scones (at least 8 normal sized ones). 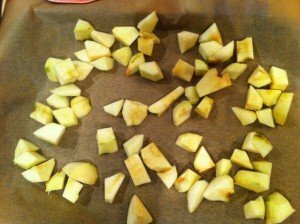 Peel and core apples, then cut them into chunks. Placed them in a single layer on a baking sheet lined with parchment paper and bake them until they take on a little color and feel dry to the touch, about 20 minutes. They will be about half-baked. Let them cool completely (in the fridge if you are eager). Leave oven on. Sift or whisk flour, sugar, baking powder and salt together. Set aside. Place butter in the bowl of an electric mixer with a paddle attachment (or a hand mixer or by hand, but it is more work), along with cooled apple chunks, cheese, cream and one egg. Sprinkle flour mixture over the top and mix on low speed until the dough just comes together. Do not overmix. Beat remaining egg in a small bowl with a pinch of salt. Brush the scones with egg wash and sprinkle them with remaining tablespoon of sugar. (I have blown off the egg wash on occasion, which is just fine, but it actually does make it better.) Bake until firm and golden, about 30 minutes. With a spatula, lift them to a wire rack to cool for 10 minutes. Eat. Enjoy. Repeat. Scones can be made ahead of time and stored unbaked in the freezer until you need them. Just take them on their baking sheet and at your destination brush them with the egg wash, sprinkle them with sugar, and bake them still frozen for just a couple extra minutes. Full disclosure, I have never done this, but it seems like a good idea. I hear these are not so awesome the next day, but ours have never lasted long enough to test that. This entry was posted in Breakfasty on September 14, 2013 by Edie Morgan.